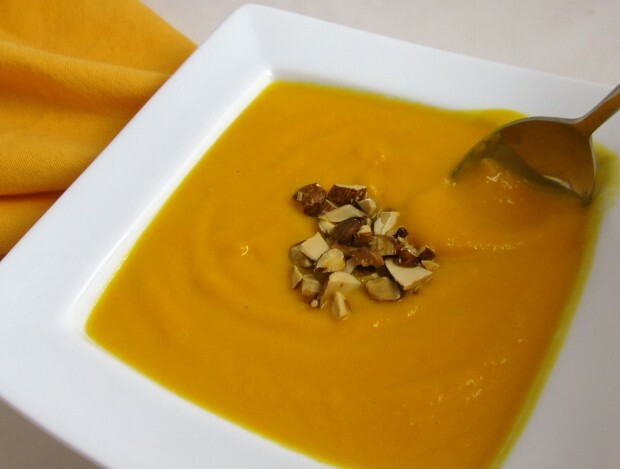 As the seasons change from winter to spring, a transition recipe, such as Carrot Soup, is good to have up your sleeve. This subtly sweet and velvety soup is wonderful served hot or cold, depending on whether you want to warm up or cool down, according to the erratic temperatures of the season. Variations on the theme of this simple soup take advantage of the ubiquitous carrot and your craving for a particular flavor profile. Seasonings may easily be adjusted to appease a variety of nationalities; add lemongrass and substitute coconut milk for plain milk and call it “Thai”. Or substitute cumin for the ginger, chopped cilantro and peppers for the nuts, and “Hello, Sante Fe”. Dill for ginger and sour cream for milk–why not? It’s all good. Heat oil in a heavy-bottomed stockpot or Dutch oven. Add onion and sauté over medium heat for 2-3 minutes, until softened. Add ginger and garlic and sauté an additional minute, stirring. Add stock and carrots and bring to a boil. Reduce heat to simmer and cook, uncovered, until carrots are very tender, about 35-40 minutes. Purée in pot with an immersion blender or transfer in batches to a food processor and purée with milk. Season to taste with kosher salt and freshly ground pepper. Garnish with almonds or peanuts and serve. This soup will be perfect for the approaching chilly weather — Thanks for publishing such creative, yummy foods! They’re the best! Sorry, but I don’t think th;e#&r8217es anything that will make me stray from the pretzels there. Oh. my. goodness. BEST pretzel I’ve ever had, hands down. And the last time I was in WDW, I was not a beer drinker at all, and I even liked the beer with the pretzel. Can’t wait for another beer-pretzel break now that I actually enjoy a good beer!